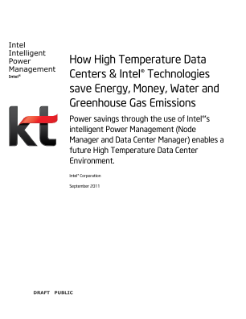 Intel®’s Power Management Technologies known as Node Manager (NM) and Data Center Manager (DCM) in combination with High Temperature Ambient Data Center operations was jointly tested over a 3 month Proof of Concept (POC)with KT at the existing Mok-dong Data Center in Seoul, South Korea. The objective was to maximize the number of servers compute nodes within space, power and cooling constraints of... the data center (DC). Increasing compute capabilities in DC’s has resulted in corresponding increases in rack and room power densities. KT wanted to utilize the latest technology to gain the best performance and best energy efficiency across their Cloud Computing Business offering. The American Society of Heating, Refrigerating and Air-Conditioning Engineers.